Besides the many great brands we sell, we also developed our own ice melter. After a multi-year process of testing the best components and with the best combinations of ice melters, we developed our private label MVP 3-Way De-Icer. 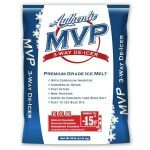 (create a link to MVP 3-Way De-Icer) Since then, MVP 3-Way De-Icer is one of the most trusted brands on the market, became the Most Valuable Player of many snow removal teams, and continues to prove year after year to be the absolute best performing ice melter in its class. You can view our delivery territory here. We deliver any size order from 8 bags to full truckloads.